While my personal Facebook page and profile continue to have good reach and engagement, the Lucire Facebook is down, especially compared with this time last year. We’ve increased fans and, on our site, readership, but it’s becoming more and more evident that traffic isn’t coming via the Facebook fan page. It makes you wonder, then, whether Facebook pages remain a useful marketing tool. If we post something without an external link, then Facebook will share that with more of our fans, and these will be in the hundreds. This is probably the best example we have at Lucire for the declining effectiveness of Facebook, with two very comparable posts. At the time, Facebook contended that algorithmic changes had been made to weed out spammy, non-engaging content, but that the median reach of pages hadn’t budged. It particularly objected to the inference that the changes had been made to spur marketers to spend more on ads to make up for lost reach. However, now comes an admission of sorts in a sales’ deck sent to its partners, revealed by Advertising Age. Folks called BS then, and they were right. So while 2012 had research showing a 38 per cent year-on-year drop, we’ve seen that 2013 has seen the figure plunge in order for the Californian social network to make more money. When I posted that Facebook was dying, I had plenty of people object—on Facebook, of course—because the network had become so ingrained. But, I thought, once upon a time it was habitual to check your Altavista or Excite home page. Once people find a better way to keep in touch, something that mirrors real-life interaction more, they’ll go. Facebook fatigue could well come from the lack of stimulation that the website represents today. While Timeline was rolled out to much fanfare in September 2011, and other nip–tucks had taken place regularly before then, Facebook has not innovated on such a grand scale since. However, like an operating system, or like some software, there’s little visual delight in Facebook in 2013 for me. The personal motive is far less than it was. And if there’s such a substantial drop-off in reach on fan pages—we are talking nearly 99 per cent—then there’s no supporting work reason to be there, either. Sure you could innovate and run competitions, but if the reach is this pathetic, does it give businesses much confidence to take the plunge? I don’t think so, not for the majority of small businesses. Facebook seemed like a recessionary tool: one where people could spend time to forget how bad the economy is. When things improve, we might just want to get out there and do stuff. All this potentially plays into Google’s hands, and that’s not something I’ll admit to lightly. Google News was Lucire’s friend today. We need reach to get engagement, and we’ll go where we can get it. The search is on. For the Firefox bofﬁns out there, I began using Super Start, after having trialled Speed Dial and Fast Dial over the past year or so. These replicate what Opera users are used to with their Speed Dial, and what Google Toolbar users have with their menus. Your most accessed websites are shown to you in thumbnail format when you open a new tab. Super Start is probably the best of them all so far. It’s compact, doesn’t seem to drain the resources, and you can program more than the eight that it comes with (I presently have 12). I only began seeking an alternative to Speed Dial because OpenX ad pop-ups began appearing. I don’t know what was causing them, but since I work with only a small handful of sites, it seemed odd that these were appearing each time I opened a new tab, usually to begin searching with Duck Duck Go. I was reasonably sure they were not coming with the search engine, Facebook or our own company sites. They were quite hard to get rid of, with a script that had a new window open up if you closed the ﬁrst. I have no proof that these were connected to Speed Dial, and they could have come from any website that I visited. Maybe there was a delay from another website (not uncommon). However, it’s equally odd that they have ceased to appear after I deleted Speed Dial and replaced it with Super Start. To my knowledge, Speed Dial sent me no notiﬁcation of a recent update that might have brought with it these pop-ups. At best, Speed Dial was the victim of unfortunate timing. Again, I’m blogging this in case other computer users have had the same issue creep up recently. Maybe we can narrow down the cause of these sudden pop-ups. Spotted on the Lucire website today, an advertisement for Consumer magazine. It’s a Flash animation, suggesting that not all car insurance policies are perfect. The opening frame shows a car with oversized coins for wheels, and the wheels shrink to a more standard size at the end of the animation. The copy reads, ‘Car insurance / Get the cover that ﬁts’. [Cross-posted at Lucire] New Zealand readers will be seeing a few advertisements around this site relating to the local body election in Wellington. And perhaps, thanks to programming not always being precise, a few more readers outside New Zealand will notice them, too, although we have targeted them for this country alone. I think it’s time to explain them to you. Long-time Lucire readers will know that I’ve put my name forward to be the next Mayor of Wellington. 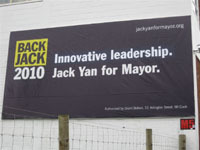 (We have not turned away any advertising from my opponents, incidentally.) Our publications will continue (in fact, we have additional editions to announce) and I will maintain a supervisory role, but the majority of my own time, if elected, will be dedicated to the people of Wellington and to give them the same opportunities that I was given as I grew my businesses here. This is an important move because those of us under 45 have not had a mayor in this city who understands the importance of the role for quite some time. Turnout among younger voters is traditionally low, except for one time: when a 39-year-old, Mark Blumsky, ran, he managed to inspire more younger voters to get out. (I am 38.) He got there through citizen engagement, and people could see that here was a potential mayor who would continue being connected. We’ll keep our events because Wellington does better with our creative talent, and we’ll grow our economy because Wellington punches well above its weight with our technological prowess. But the one thing that I keep hearing, more so in the last weeks of the campaign, is the lack of transparency and the failure of politicians to engage early with people. Decisions are almost brought to Wellingtonians as faits accomplis, with citizens feeling disengaged. This was the theme at several sessions of Residents 2010, a conference for residents’ associations earlier this year. Coverage of the event was to have been my op–ed for an earlier New Zealand print edition of Lucire, which had to have been delayed this year due to a decline in advertising. Ironical, then, that we seem to be continuing abroad—thank goodness for export markets, so we can keep companies going here. It’s a lesson to learn. Beginning with a video from John Ralston Saul, of whose writings I am a huge fan, the theme was set. Cities might have lovely facilities now—if you can afford them. And somehow there is a tax shortage despite there being so much money. Saul blamed the specialization of management, because decisions were given to specialists, who failed to engage with citizens; and that he had little time for what he called ‘the efﬁciency dogma’. Whenever I hear the word efﬁciency, I immediately think of Slater Walker and any argument made by various corporate raiders of the 1960s through to the 1980s; but besides that, Saul is right. There is insufﬁcient engagement in this city and in others with citizens, and politics is the one area where there hasn’t been enough democratization. Session after session, the same theme emerged. Attendees argued that engagement would not open the ﬂoodgates to making a city less efﬁcient. That politicians feared losing power through engagement. That the Local Government Act does not empower local representatives to represent local people. That electronic media should be used for continued engagement, as an ongoing process to the exchange of ideas between Wellingtonians and our City Council. We’ve seen democratization in business. Multi-million-dollar ad campaigns can become nothing if someone makes a viral video refuting their messages. And politics needs it, because the tools are there: the web is a great way to engage; and people do indeed have their say when bad decisions are made. How about engaging so early that we don’t make those mistakes, not just with pressure groups, but with all citizens? I don’t care if it’s Facebook, Twitter or some other service—if we can do it in publishing, by talking with you through this website, then why can’t a city? No mayor is an island, especially when (s)he must be an advocate and a representative. And that, in a very long-winded way, is the reason for these ads: a reminder that you can come to me with your concerns—early. So you know where to go to if you want to see what is being discussed in your next council. So there can be early engagement, in this case, prior to my potentially taking ofﬁce on October 10, 2010. Between a few of us here and my friend Pete in the UK, we’ve spent nearly two weeks trying to get OpenX to work. We’re ﬁnally getting ad-serving technology put in in-house, after years of relying on the US ad networks we primarily work with. It’s also walking the talk: since I have advocated that Wellington moves to open source if I am elected mayor, then it makes sense that our Linux servers are running ads off an open-source ad-management program. The ﬁrst problem might have been caused by me personally: OpenX wouldn’t install. Pete re-uploaded the ﬁles, we chmoded the directories, and away we went. Autocade has been the ﬁrst domain to host the ads that we are sending along, and it’s been so far, so good. However, today we decided to give the home page of the Lucire web edition a go, and encountered a problem. All was well for the ﬁrst few hours, but then I noticed something strange: two different computers at this ofﬁce were behaving differently with the geo-targeting. On computer one running Windows XP, the above was working. I’ve a fair idea of how geo-targeting works and two computers on the same network going through the same router with the same (outward) IP address do not, in theory, behave differently. So, if any OpenX experts are out there and can answer our geo-targeting question, please give us a shout in the comments. Despite ﬁddling around with all these online ads, there’s one company I know I will never deal with. And it’s not as though the online ad industry has come to us with clean hands, either, so this sullies them further. Somewhere along the line, I must have got to a web page that hijacked my web browser. It didn’t alter the hosts’ ﬁle, and I was eventually able to correct this by deleting all cookies and clearing the browser cache, but it left me with one clear message: I will never deal with Mediaplex. Based on the above, this conduct is highly unethical and is nearly as bad as planting a trojan or a virus on to a user’s computer. And Googling the incident, I found that many others had encountered the same, sometimes when typing in other sites. I was saddened to ﬁnd out that Mediaplex is part of Valueclick, a company I dealt with for years. We eventually ended our contract with Valueclick. I don’t recall the reason exactly, but I suspect it was down to the low advertising rates the company delivered. There were no concerns over its behaviour. Dormant Accounts. If Publisher’s Account has not been credited with a valid, compensable Transaction that has not been Charged-back during any rolling, six consecutive calendar month period (“Dormant Account”), a dormant account fee at CJ’s then-current rate shall be applied to Publisher’s Account each calendar month that Publisher’s Account remains an open yet Dormant Account or until Your Account balance reaches a zero balance, at which time the Account shall become deactivated. Transactions will not be counted if the Transaction subsequently becomes a Charge-back. In English: if you don’t make a sale over six months, they have the right to charge you. When you pay it all back, they kill off your account. This latest stunt tarnishes the entire group: Commission Junction, Mediaplex and Valueclick. Caveat proponor.